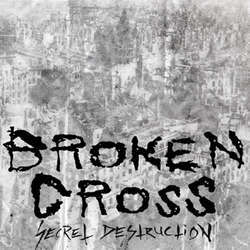 Second 7" from Swedish, one-man band Broken Cross. Four brand new songs of raw, metallic punk madness. FFO: G.I.S.M., Zouo, Holy Terror, etc. Artwork by Dwid Hellion. I hear the destruction of war, I hear death blowing in the wind, I hear melody galloping alongside the headless horsemen…and it’s never sounded so good! What I hear is the new 7 inch by Broken Cross blasting out of my speakers. With each listen to this maddening piece of vinyl you will notice something creeping into your eardrums. By CVLT Nation.